What a productive week I’ve had, considering we also had a birthday party to organise. This week there are two WIPs again, and both have had work done on them. The baby blanket has had two rounds added to it, and is definitely heading in the right direction. I’m still on a mission to get it finished by the end of this month, so I can get it washed and blocked ready to gift. I’m hoping these will be finished by next week, as they’ve worked up pretty quickly so far. 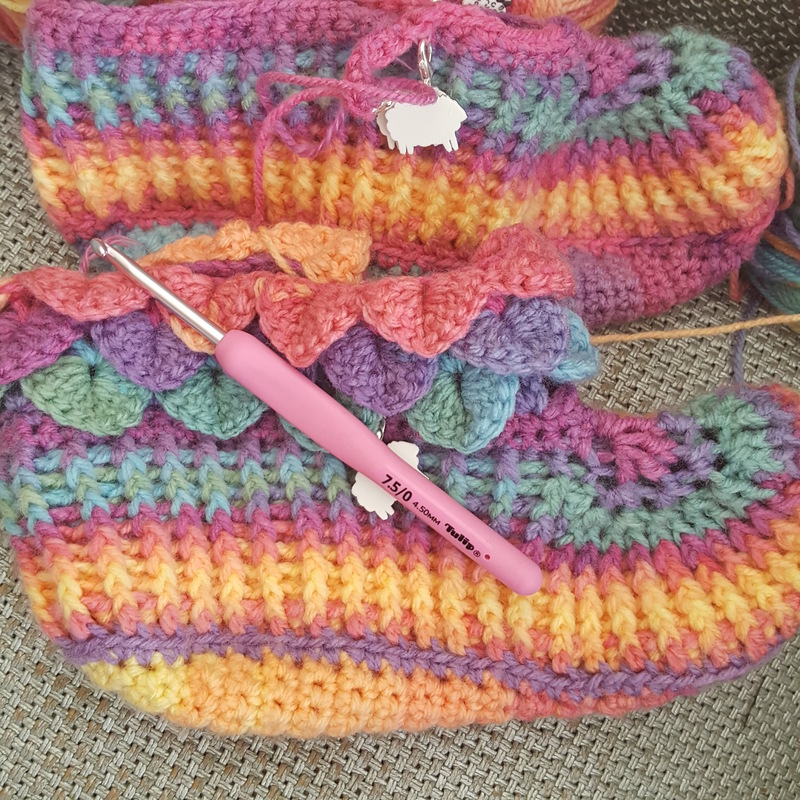 These two projects are almost polar opposites in terms of difficulty; the blanket is really repetitive, but lovely and relaxing to work on, whereas the slippers are quite complex and require counting/pattern reading every row. It’s quite nice to have such variety, I definitely think having two projects on the go is ‘ok’ for me, despite having reservations about whether or not I’d get them done. What are you working on this week? Do you prefer easy patterns or tricky ones? How far do you challenge yourself when choosing a new project? T shirt yarn is one of the things I’d like to try eventually, and a crochet retreat sounds like heaven! It makes you feel like you have had a work out using t-shirt yarn but the results outweigh the strains. The retreat was lovely as had time to actually finish projects we started! I love both of your projects! I’m a few rows from finishing up the baby blanket I’m knitting and need to make a hat to go along with it. Then I get to get out of boy babyland and head off into girl territory. Baby girl is a Rainbow Baby and Mama wants a rainbow blanket, so I’ve been looking at a lot of patterns! Thank you, I love making baby things and rainbows are such fun! Enjoy choosing a pattern. Thank you, these colours make me smile too, and the odds and ends from projects seem to be lasting forever! That baby blanket is so beautiful and so incredibly neat. It will make such a special gift. I must have missed the slipper somewhere but they are great fun too. I agree, one ‘easier’ project and one more challenging on the go. Sometimes counting is too hard!! Thank you, the slippers are a ‘blink and you miss it’ kind of project which I only began last week. Your baby blanket is so beautiful. I don’t think there is ever a problem working on more than one wip at a time. Keeps things interesting that way. I too am working on a baby blanket at the moment. I’m hoping to get a blog post up about it later today. I’ll look out for it, I love baby blankets, and a good excuse to make one! I love both of those projects! I don’t think I’d be able to do any craft of I was studying at the same time, so well done for managing socks! Hope it’s all finished soon so you can make something else. (Unless you want to make hundreds of socks?) 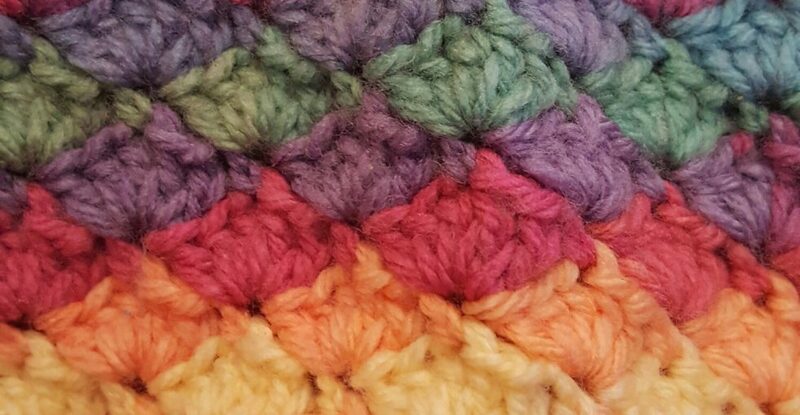 The blanket is go to after a tiring day as it’s easy to pick up and put down, whereas the slippers cannot be put down anywhere except the end of a row and then I have to mark it on the pattern! Thank you, it took some figuring out even with photos included in the pattern! I’ve made those slippers! They’re so comfy and I love the dragon scales. Before moving, I thought I only had 2 WIPs on the go. But having unpacked everything it turns out I have 2 blankets, 3 hats, an amigurumi cat, a coaster, and a flower to finish! Wow, good luck getting them finished! I can’t wait to wear my slippers. 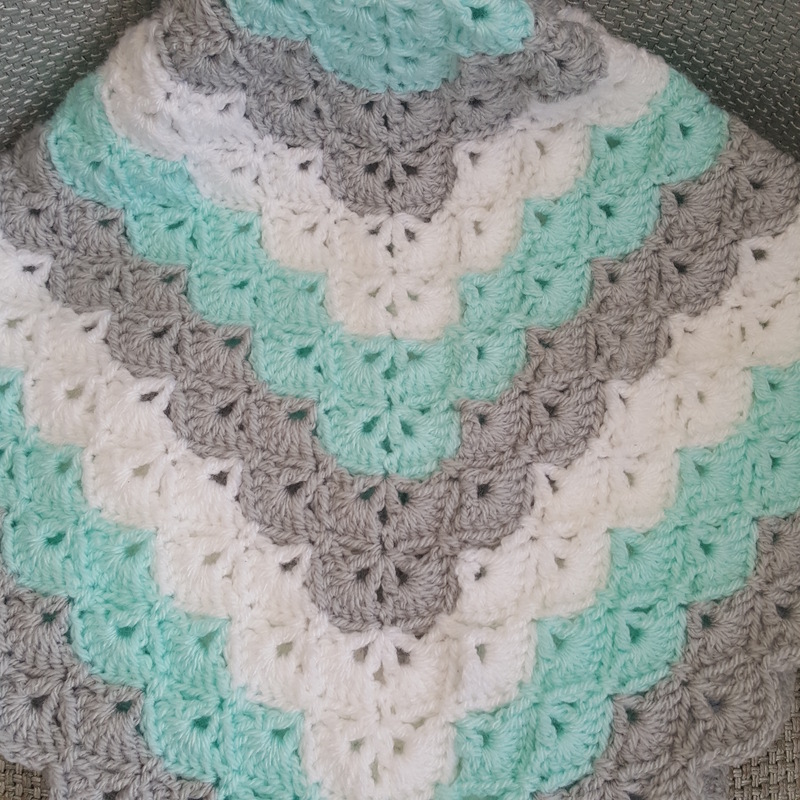 I am so in love with that baby blanket!!! Such a beautiful pattern and your colors are so awesome!!! I have printed out the pattern and will have to get to this one day soon. I just melt every time I see that sweet blanket of yours. Ahhhh. The colors in the baby blanket are beautiful. I currently have three crochet wips, I stopped counting the others! One is an order, another is a Mermaid Tail, and then I have a CAL project that patterns are released every two weeks through November. Orders come first, then the Crochet aLong and when those are caught up, I work on the tail. That way I always have something to crochet! Thank you, it sounds like you are ever so busy with all your projects! Love both projects they are so different. Crotchet nowdays is definitely simple, though with stitching I like to have both difficult and easy ones in my rota. When I was in my early teens crotchet was very fashionable but then it was very fine cottons for table runners etc. and the more challenging the better but I have only recently started to try again after a break of over 40 years and I am finding it a challenge at the moment. I get muddled with UK and USA sizes and terms plus I have forgotten so much; I am doing a blanket to cover the plain sofa in my craft room and to use up all the wool I have left from the days when I did knitting but its a pick up and put down kind of thing for when I’m not in the mood to stitch. I often admire the more complicated projects, but I’m not brave enough to attempt them! It’s so soft, hopefully it won’t be too warm for baby! Both projects are looking lovely! I am still working on the baby blanket – my cat only allows me about 10 minutes before she pounces on my uarn, so it is taking a while! I think I prefer simple projects that I can pick up and put down. Simple projects are probably better if you keep getting disturbed lol!